How it all began on 29th May 1865. In 1856, the Great Eastern Railway Company extended its line from Stratford to Loughton. The arrival of a railway slowly changed Wanstead from an unspoilt, rural village to a mature suburb of London. The railway started a housing boom and new roads, buildings and the subsequent increase in population altered the face of Wanstead Village forever. In the wake of the arrival of the railway, gentlemen’s villas were built in spacious grounds along the main road that became New Wanstead and also along Hermon Hill and the new roads east of it. This created a middle class enclave set apart from the old village, whose main function had been to service the needs of the inhabitants of the many grand houses to the east and south. At the beginning of the nineteenth century, there were approximately 160 inhabited houses in Wanstead. The rise in population tells its own story. In 1863, there were about 3,000 inhabitants and by the 1931 census there were 19,183. In 1863, despite the rapid rise in population, there was still no Non-Conformist place of worship. The first half of the 19th Century was a period of expansion for congregationalism. Many poorer people joined these churches and a new political and social radicalism emerged. The church was greatly strengthened by its association with the Liberal Party. The Liberal election victory of 1906 represented the peak of the social and political influence of Congregationalism. In the 1860s and 1870s, there were now many prosperous manufacturers and city merchants living in Wanstead. There were also other members of a new, confident, self-reliant, staunchly independent middle-class, who were drawn to the Non-Conformist Churches. Congregational churches shared fully in the civil life and prosperity of Victorian England. Victorian Congregationalism had a great zeal for self–improvement and the desire for a richer life. On 18th August 1863, a group of friends came together at the home of William Nield, a Coffee Merchant, of 8 Forest Place, Leytonstone. They discussed what could be done about the inadequate provision of places of worship for Non-Conformists in the rapidly expanding Wanstead and Snaresbrook Villages. A pastor, the Reverend Benjamin Beddow was appointed in 1865 for this new fellowship. It began meeting for worship 150 years ago on 29th May 1865 in the Court Room of the Weavers’ Alms-houses. Until I began doing the Church flowers my only flower arranging experience consisted of buying a bunch of flowers I liked, taking them home and popping them in a vase. After agreeing to oversee the flower festival my immediate feeling was one of panic! It was suggested that I should speak to Margot Cooper, a well renowned local flower arranger and what good advice that was! Margot arranged everything, including asking the ladies of the local flower arranging groups to help. We had decided that the theme should be “All Things Bright and Beautiful” because isn’t that the impression we get from our wonderful building? I was very disappointed to find that many of the local churches were unable, for one reason or another, to participate and in the end the whole display was put on by members of Wanstead URC, Christchurch who did two displays, one of them for the 19th Epping Forest Scouts, Gants Hill and, thankfully, Wanstead House and Woodford Flower arrangers who were amazing. These ladies turned up on Thursday afternoon to prepare the flowers and then worked all day Friday too. Our Lady Of Lourdes and St Gabriel’s Church gave us monetary donations and for this we say a big thank you. The flowers and the whole church looked wonderful and the many comments left by visitors gave testimony to this fact. Margot and Sue, one of the other ladies had, earlier in the week, won a silver gilt award at the Chelsea Flower Show and brought their flowers and part of their display to decorate our Church. Owing to the fact that we were given these flowers and loaned trays and other necessary equipment, we were able to keep our costs down. This and the donations left by grateful people meant we managed to produce the flower show at no real cost, an amazing feat! A belated thank you to all who helped in any way to make this festival such a success. 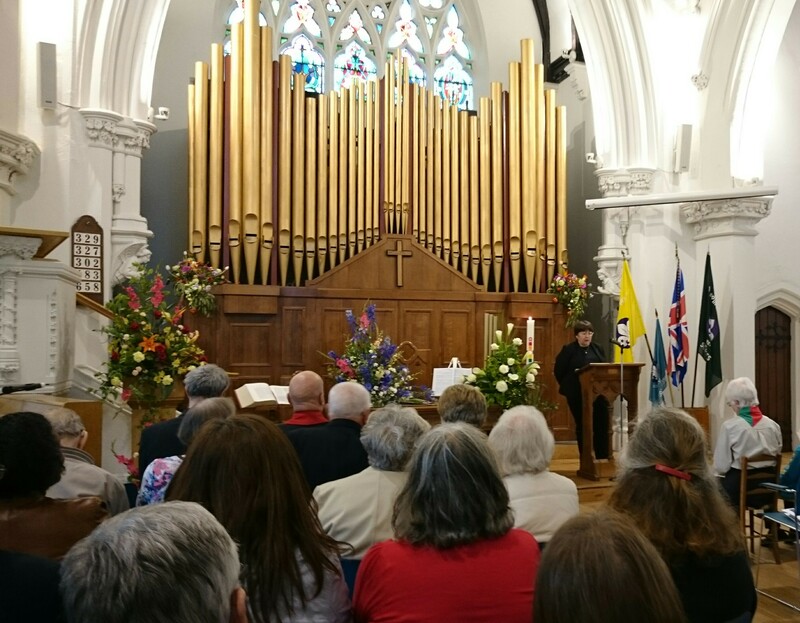 Another amazing fact was that the flowers lasted the week so were still looking colourful though not at their best, when we had a visit from John Ellis for our special 150th Anniversary Service on July 31st. God was certainly looking down on us that week!